Spraying powder coat is a fairly simple point-and-shoot job once you get the hang of it. After you have done all of the necessary cleaning, blasting, and masking; shooting the powder is the next step. This article will help you achieve the correct coating thickness and avoid orange peel and other defects. Start off by hanging your part on some type of rack with a clean metal hook. If you are grounding your part through your rack, the hook must be clean and free of coatings in order to transfer the ground to your part. Ideally you should have plenty of lighting to easily see every area of the part. However, it is also very helpful to have an LED flashlight handy. It is best to shoot powder coat in some kind of booth to keep your work clean and prevent over-spray from going all over your garage / shop. You can make a home-made booth using cardboard boxes, wood, or anything you can think of. A box fan with a furnace filter can be placed on the back wall of the booth to catch overspray. If you have a powder coating shop, you can buy purpose-built powder coating booths or build a small clean room. It is important to be in a clean area to prevent crap from getting onto your parts as you are spraying. Make sure to shower or spray yourself off with air before coating as a lot of contaminants will transfer from you to your work. I have recommended several safety items near the bottom of the article that will protect you while you are powder coating. The adjustments for your gun are completely dependent on the type of gun you have. If you are using the Craftsman Powder Coating Gun, there are no adjustments or air pressures to set. However, all other powder coating guns require you to at least set the air pressure going into the gun. Powder Coating uses very low pressures. Most often, you will be using the 5-10psi range. When shooting complicated parts with lots of recessed areas (Faraday cage areas), it is best to set the psi just high enough for the powder to spray out of the gun. Lower PSI will help to achieve coverage in the Faraday areas. The best way to set the pressure on your gun is with a wall mounted regulator but keep in mind that there will be pressure loss through an air hose so setting the wall regulator to 8 psi will not produce 8psi at the gun. You can overcome this by using an inline air pressure gauge right before the gun or just trial and error. Trial and error involves adjusting the regulator from 5 psi up until the gun produces a good powder cloud. You can also use a mini regulator right before the gun. Higher end powder coating guns will have adjustable KV (Kilovolts) settings. The higher the KV setting, the better the transfer efficiency, as in more powder will stick to the part instead of becoming over spray. However, higher is not always better. If you are shooting a large flat panel, it is best to crank up the KV setting up to 100KV, just make sure that you are keeping adequate distance between the gun and the part (~8 inches). Higher KV settings commonly cause a defect known as back ionization which will appear as tiny dimples the coating. You would use less KV for a more complex part. The more complex the part is, the less KV you want to use. 50KV is a good average for shooting first coats on most parts. If you are having trouble getting powder into a Faraday area, turn the KV down, less is more in this case. When shooting a 2nd coat, always turn the KV down to 20 or 30. This will allow easier attraction between the powder and the part. If you are using the popular Eastwood Dual Voltage Powder Coating Gun, it is adjustable to either 15KV or 25KV. You can complete most powder coating jobs with the 25KV setting, and lower it to 15KV when shooting 2nd coats or if you are having trouble getting powder into a Faraday area. 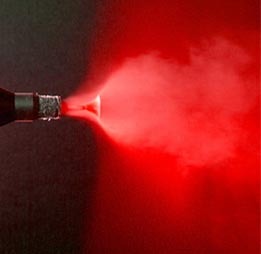 Professional powder coating guns will offer several more settings and a selections of nozzles to suit every powder coating job. However, these settings cannot easily be explained for all the different types of guns there are out there and if you spent several thousand dollars on one of these guns, it is best to thoroughly go over the instructions or have a rep come out and teach you how to properly adjust your gun. After you have the gun adjusted correctly, it is time to start spraying the powder. Before you actually begin spraying the powder, look at the part and plan out a course that you will follow when shooting the part. It is best practice to spray any Faraday areas first and then move onto the flatter areas of the part. As a part is covered in powder, a charge will build up, and this charge will make the Faraday areas even more difficult to spray into. That is why you spray them first. Once you have your course mapped out, you will begin by spraying the powder coating gun away from the part until a nice even, non-sputtering cloud is being sprayed. This should take a second at most. Then you will move the gun to the part and it is best to keep the trigger pressed until you have achieved full coverage on the entire part. It is best to operate in a slow, controlled motion throughout the part, keeping a gun-to-part distance of 6 to 8 inches. Instead of erratically spraying the gun all around the part, attempt to achieve full coverage with 1 pass throughout the whole part. Once you have completed your spraying, you can confirm that you have full coverage by going over the whole part with a bright LED flashlight. However, when I personally like to keep the flashlight pointed at the part the entire time I am spraying. The flashlight will show any areas where bare metal may still be showing through. These spots do not have full coverage, and if the part where cured in this state, they would have a very textured look in that area. Touch up any bare metal spots you see with the flashlight before curing the part in the oven. Faraday Area Tips: When using a hobbyist powder coating gun, it is often very difficult to get powder into Faraday areas even with all of the right conditions. 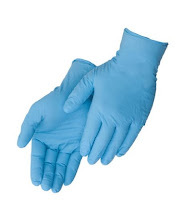 The following techniques should allow you achieve coverage in these areas. Try some or all of them until you find something that works for you. 1. Ground your parts using a dedicated grounding rod. Wet the ground around the rod for better efficiency. 2. Make sure to spray these areas first. 3. Try lowering the PSI to the powder coating gun for these areas. 4. Turn down the KV if possible. 6. Try touching the corner of the part with a clean bare hand while shooting these areas. 7. If all else fails, use a heat-gun to heat this area of the part and then spray the powder. Achieving the right amount of powder on the part is very important for durability reasons as well as eliminating orange peel. If you spray too little powder on the part, you will most likely end up with a grainy texture to the powder also known as "tight orange peel." This is because there was not enough powder on the part for it to flow-out and create a uniform coating. Besides the poor aesthetics of this, the part will likely start to rust or oxidize in these areas because air is allowed to contact the bare metal still. Using an LED flashlight is the east way to overcome this. If you spray too much powder on the part, you will most likely end up with large wavy orange peel. The excessive thickness of the powder will also make the part more prone to chipping. Achieving the perfect powder thickness, not too light and not too heavy will take some practice. Make sure to take note of any orange peel you get and keep in mind that you need to shoot the next part heavier or lighter. I have found a somewhat reliable method of keeping an LED flashlight on the part the entire time that I am spraying. As soon as the flashlight no longer reveals bare metal in a spot, that is the perfect amount of powder and I do not spray any more powder. 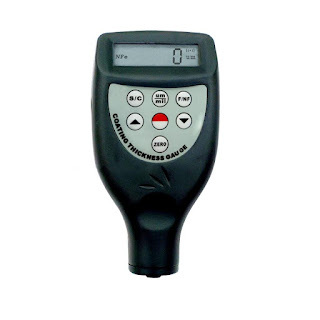 A more reliable and scientific approach to this is measuring the thickness of the powder with a Mil Thickness Gauge. This can only be done after the powder is cured in the oven. If you are serious about powder coating, I strongly recommend adding this tool to your collection. If you are powder coating for customers, I would say it is a requirement. The price of these has come down drastically over the past couple of years and it will allow you to read the thickness of a coating. It is best to get one that works on ferrous (steel, iron) and non-ferrous (aluminum, magnesium) metals. This mil thickness gauge reads both and it also has v-groove probes which allows you to make your readings on curved parts.To use this properly, you would shoot a part as you normally would, cure it in the oven, and then read the thickness. All powers will have a recommended mil thickness range usually between 2.0 to 3.0 mils. As long as the mil-thickness you read falls into the range, the part has the right amount of powder on it. If it is too little or too much, make the necessary adjustments the next time you powder coat. This is the best and fastest way to learn how much powder needs to be applied. Extra Tip: To achieve mirror-like coating, completely free of orange peel, I have had great success with this method, especially using gloss black. 1. Shoot the powder just like normal. 2. Put the part in the oven and set the temp to 245 degrees F.
3. As soon as the powder looks wet, remove the part. 4. Immediately spray a very light coat, just enough to not see a reflection. 5. Insert the part back in the oven and do a full cure. Before you begin to any powder coating job, it is important to protect yourself. Powder is not nearly as toxic as liquid paints but it is still important to keep it off of your skin, out of your eyes, and out of your lungs. There are different levels of protection depending on your level of powder coating. The weekend warrior can get away with the bare essentials. However the professional coater that powders coats 50 hours a week should aim for complete protection. 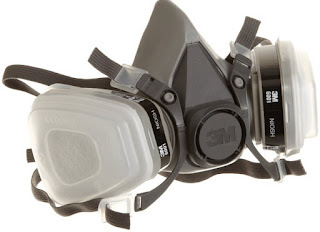 Hobbyist Coater: I recommend a 3M respirator, safety goggles, a long-sleeve shirt and some disposable gloves. 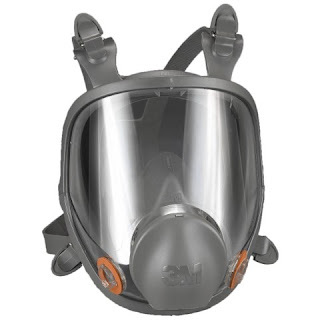 Professional Coater: I would recommend a 3M Full Face Respirator and a Tyvek Suit. 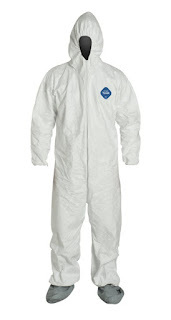 Not only will the suit keep powder from getting on you, it will also help prevent dust and hair transferring from your clothes to your part while you're spraying. Following the guidelines in this article and some practice, you should be able to overcome any issues that arise while spraying single-stage powder coats and achieve an excellent finish. Now that you know the correct way to apply one coat of powder, learn how to apply multiple coats. If you have any questions, feel free to leave a comment. Also check out a new section on this site: Recommended Powder Coating Supplies. It has a lot of quality tools that will help you out in your powder coating journey. Thanks! Have been waiting for this article for couple of months! Sorry for the long wait but it is finally here. I have started working on the multi-coat article so it should be around the corner. The starburst effect is likely caused by static on the part. If you blow off the part with compressed air between coats, it can cause this static. In the future, if you blow off parts between coating, you can dissipate the static by heating up the part in the oven for a couple of minutes. 200 degrees for 3 or so minutes will do it. for the "Extra Tip" do you have to ground the part? or can you just spray it directly out of the oven without grounding? You always have to ground the part being sprayed. When doing a recoat on a VERY large part, is it necessary to respray the entire part, or can you touch up the spots that need it? An example is a large frame for a vehicle that was sprayed and cured, but there are a couple of small spots where the powder is too light. For parts that large, I would not re-coat the entire thing. I would just touch up the areas that needed it. I coated motorcycle oil tank. It has minor orange peel that I would like to correct. Only a small portion of the tank needs fixing because the rest is hidden. Can I sand down the orange peel (like you would with paint) on the part that shows, re-coat that area and re-cure? Really the simplest way to fix this while still doing it right is to sand down the orange peel in the affected area and also scuff up the rest of the tank. Thoroughly blow off any dust and wipe it down with a tack rag. Then recoat the entire tank. If you have the products on hand, you can cut and buff the tank. Lightly sand down the orange peel using 1000Grit, 2000Grit sandpaper and then you can use a buffing system (like the 3M Perfect It system) to bring it back to a shine. You can use the same principles as cutting and buffing an auto paint job on the powder coated tank. I do not recommend spraying powder when the part is hot unless it is a very specific situation. As long as you have a good ground like a ground rod, and a clean hook contacting a bare metal portion of your part, you should be able to spray the clear while the part is room temp. It is okay to heat up the part to around 100 degrees but if you part is anywhere around 150+, the powder will start melting upon contact and you run the risk of spraying too much powder. Thanks. I just want ask if i doing recoat what the steps i should do before recoat? 3. Ensure that the hanging hook is still contacting bare metal. If not, you can take a small file to where the hook contacts the part and remove some powder. 4. Shoot your next coat. How do I maintain the DFT <80microns for powder coating component. what parameters should I adjust ( air pressure, Powder, uA and kV. So after reading your guide and strategies....I currently have the 8 guage grounding wire ran to a breaker bar then i have a regular insulated wire with alligator clips going from the grounding bar to the part.....Should i skip the grounding bar and just run the 8 guage to the part holder and attach it for better results? Thanks in advance for your help, your articles are great. After spraying, can you re-use the powder? Also, how do you bake items that are sprayed on both sides? Do they have to hang or can you lay them flat? Large batch operation powder coaters can and do re-use powder but if you are just powder coating in your garage/shop then you most likely will not have the proper setup in place to ensure the powder actually is re-usable. I do not re-use the overspray powder as any dirt or debris in the powder will contaminate the powder and therefore the next thing you powder coat. Most items are hung to keep the contact point with another surface as small as possible. For some items, a simple jig can be made to hold the part in a way that allows you to powder coat it. You do need to be able to spray the entire part in one shot before you cure it in the oven. Hi Sean, really great information, thanks a lot for sharing it! Do you have any experience with triboelectric guns? Can they also cause back ionization and if yes, how to avoid it? Also when applying thicker coatings consisting of 2 or three layers, how to counter the isolating effect of the previous layers using a tribo-gun? Are there any general rules for tribo-systems? Thanks in advance ! Hey Sean, After reading your Extra tip on ways to get no orange peel, would this process work when shooting Chrome as well? I have not tried it with chrome because chrome usually lays out without much orange peel for me. I imagine the results would be similar though. If you have a part that is already powder coated and has a full cure, coating this part with new powder give you a acceptable result. I had heard that a partial cure was needed and the part cooled to room temp, before adding another color or second coat of powder to allow cross linking. Doing a partial cure before shooting a second coat is the best way to go to allow the coats to cross link. However, some powders, such as chromes, are not compatible with this method and a full cure must be done before top coating. If you powder coated the part and did a full cure already, the top coat you spray on will not be as durable as it would be if you did a partial cure and it may delaminate in the future. If it is a customers part that you are doing, it is highly recommended to strip the part, and start fresh, doing both coats with a partial cure in between. Can spraying to much or to little cause color to be off?